Below is our interview with Dr. Ann Martin, an astronomer who left astronomy to become a STEM program evaluator working with NASA. While a PhD student at Cornell, she recognized her interest in outreach and education and developed her experience in these areas with the support of her PhD advisor, Professor Martha Haynes and Ricardo Giovanelli. After receiving her PhD, Dr. Martin became the first NASA Postdoctoral Program (NPP) Fellow funded through the NASA Office of Education at Langley Research Center. She now works for a mid-sized government contractor as an evaluator supporting NASA-funded Earth science education programs, working with STEM educators who bring NASA data into classrooms, and encouraging students to think like scientists. At the American Astronomical Society (AAS) Diversity Summit last fall, its Committee for Sexual-Orientation and Gender Minorities in Astronomy (SGMA) decided to take on the project of improving institutional policies regarding gender identity and expression across the field of astronomy. We are starting that project with a request to readers of the Women in Astronomy blog to let us know the policies at their institution. I have set up a web survey to accept your answers. No personal information will be recorded. For people who are not minoritized, sometimes it can be difficult to imagine what inclusion and exclusion feel like. Here I share two recent experiences of mine that led to very strong feelings of inclusion and exclusion. They are everyday moments. But because of my past experience, both of them were hard to miss. And both of them changed how I experienced the rest of my day, and the space that I inhabit at work. I recently attended a training program at my new institution. It was three days focused especially on teaching and mentoring. One of my workshops asked us to pick an adjective for how we’d like our class to perceive us. We were discussing the importance of first impressions (Apparently the first few minutes of class often set up how your students perceive you all the way up to evaluation time, so it is worth considering how you want to be seen.) We went around the room and I kept a running list/tally of adjectives. I went early. I picked “Challenging”. We’ll save that psychoanalysis for another day. 1. Women on Spacecraft Missions: Are we moving towards parity with the percentage in the field? The following blog post was written by Dr. Julie Rathbun, Senior Scientist at the Planetary Science Institute and Professor of Physics at the University of Redlands. The post was originally posted at the Women in Planetary Science blog, and is cross-posted here. The photo above was taken during the July 2016 meeting of the Science Team for the Europa Multiple Flyby mission. All of the women at the meeting (most of whom are members of the science team) wanted to celebrate the accomplishments of women scientists by taking this photo. It was shot after Dr. Margaret Kivelson was honored by the Project with the Monolith award. During her speech, Margie discussed the challenges she’d faced over her more than 50 years as a scientist, many of those due to being one of a very small number of women scientists. For more about her talk, see https://storify.com/LokiVolcano/margaret-kivelson-at-europa-psg. 1. CSWA Chair = NASA Deputy Program Scientist for OSIRIS-REx = LAUNCH TODAY! 4. Do women in STEM careers suffer a ‘marriage market’ penalty? CSWA Chair = NASA Deputy Program Scientist for OSIRIS-REx = LAUNCH TODAY! Christina Richey, chair of the CSWA, is participating today in the launch of NASA's OSIRIS-REx Mission as deputy program scientist at NASA Headquarters. OSIRIS-REx will journey to the carbonaceous asteroid Bennu to collect surface samples that may trace the earliest composition of our Solar System, including water and organic molecules. The mission will also map Bennu's surface and test the Yarkovsky effect. The launch is garnering lots of public interest as one of what could be a number of asteroid sampling and surveying missions supported by NASA. 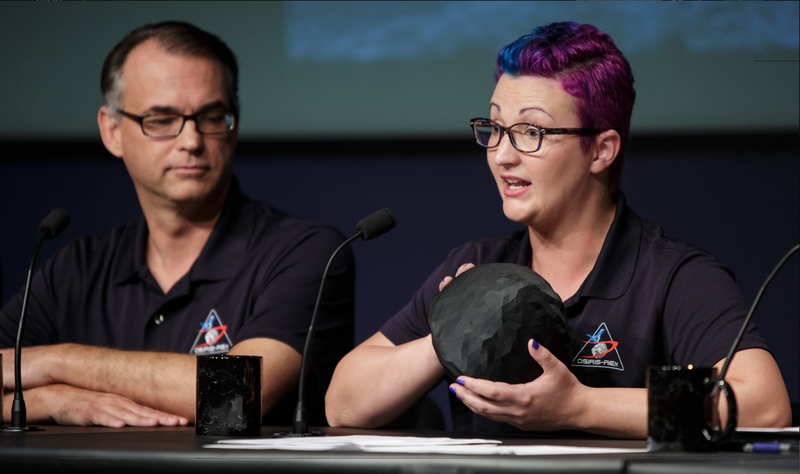 In this photo, Christina is showing a 3d model of Bennu; instructions on how to print one yourself are available to all. If you are curious about other scientists working on the mission, also check out this CSWA career profile of Harold C. Connolly Jr, a mission scientist for OSIRIS-REx. You (and your friends) can watch the launch live today on NASA TV beginning at 5:30pm ET -- the actual launch is planned for 7:05pm ET.